You have a few hours to lose. Bored and really nothing to to do. Your mood picks up as you realise that you could go for a short flight, somewhere new, somewhere you haven't been before. "That would be fun!" It usually comes to a grinding stop, The thought of spending 20 minutes to create a new flightplan is going to take the shade off your time and you want to get straight to the fun. You could wing it? okay sorry about the pun. By getting your maps out and flying VOR to VOR in VFR. It is fun doing VOR radials, but mostly you know you are going to need a flightplan and the choices are usually rather old or hard. We all have our favourite tools, The "Goodway" or "SkyVector" or some really bad Google based tools that are so slow in loading and clunky that your mood deepens with frustration by the minute. The Goodway v4 is the most workable. But so old and out of date now I have to switch to a very old computer to a ) make it work, and b ) it is frustratingly slow to complete a full plan. A new 5 version has been vaperware as long as the word vaperware has existed. last sign of any activity was back in Sept 2012. "hello anyone out there?" 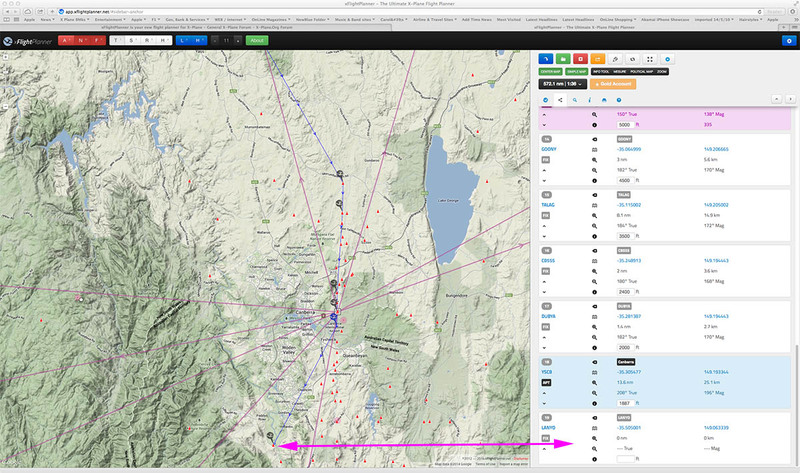 So route planning can be a chore more than one of the more exciting things you can do in flight simulation. 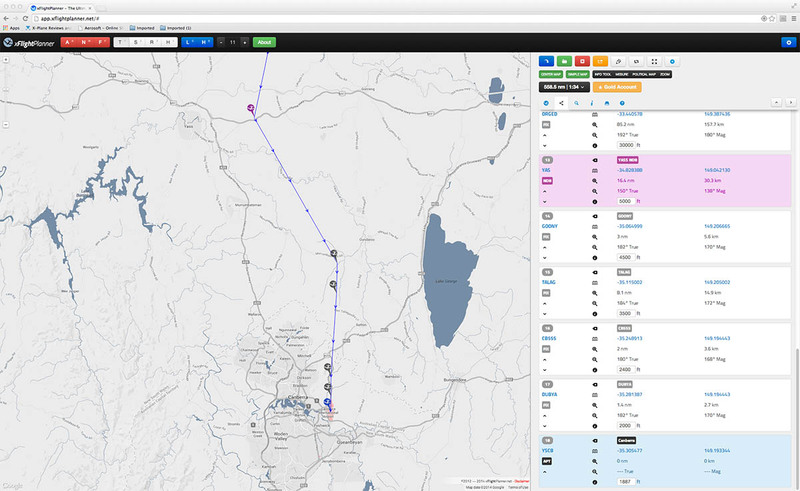 I quite like route planning, but I hate the poor interfaces and the thought of spending 20-30minutes to get a plan just to do a short flight is usually going to get the response of "ugggghh I need a route, more boring time wasted". 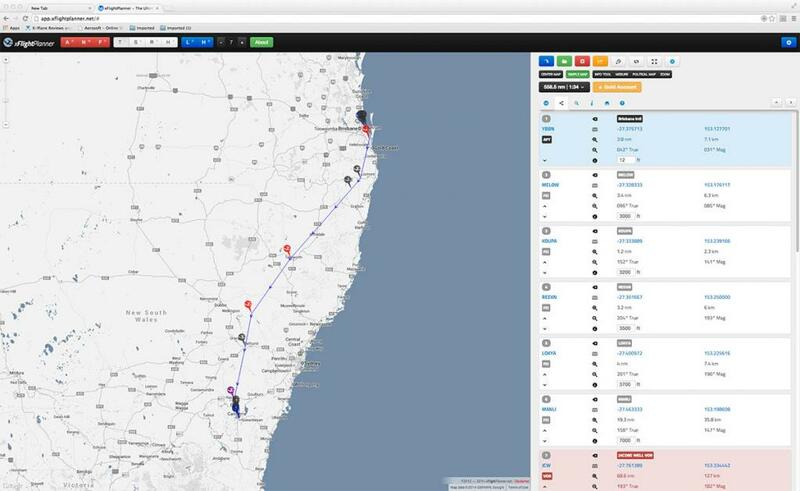 So any new flightplanner is worth considering. upsidown (Arnaud) created a google version a few years ago. It was okay but very clunky and extremely slow in loading those google maps that was my choice in only a the very desperate of time of wanting just a very rough flightplan. The original (free) version has been completely rewrote and is now available (with a member account) an it still a free application for the basics. You do have now also the option of course to upgrade to a Sliver or Gold account (for a fee) that adds in many new and extra features. What are the initial benefits? Well it is fast, very fast and if you know the basics then you could run out a very rough route in a few minutes. Say here to there via that, that and that. and your in business. It is that quick. But it does have a lot of features that makes it very versatile to use. 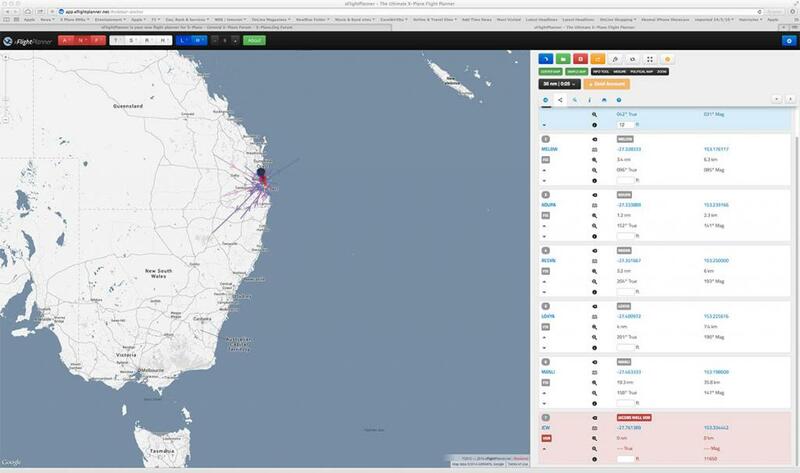 To see what you have we will do a medium route from (YBBN) Brisbane to (YSCB) Canberra in Australia. This is of course using the "Gold" account, to show you all the features that you have available. You must have an account to use the application and you sign in on the right flip out panel. 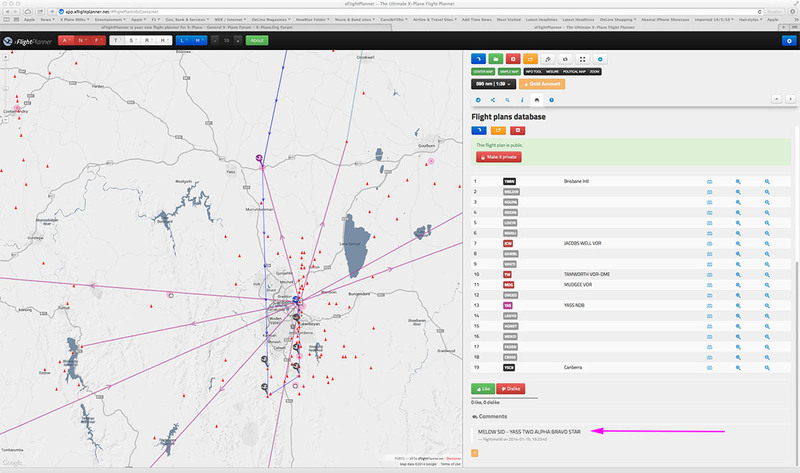 The interface can be run on any browser including Android and iOS. Google Chrome is best, Safari is fine but the latest version of Firefox (26.0) is causing cursor problems. Most of the top interface is quite easy to understand if you use google maps and other flightplanners. Here is our route from YBBN to YSCB. The fixes are listed in the slide out sidebar on the right, of which I feel is too wide and takes up too much of the space of the map area. The interface however is very clean and very easy to navigate. On the top bar (right) is a set of buttons for the A N F are Airports / Navigation-Aids (Nav-Aids) / Fixes (waypoints) These when selected show the airports/Nav-Aids/Fixes on the map. T S R H are Terrain / Satellite / Roadmap / Hybrid which are all google map tools. L is Low routes and H is High routes. There are two zoom tools, the standard google slider and another - and + (which depth counter) in the tool bar. About is about the application. Selecting YBBN will give you the information of the airport by pressing i. I selected the Low routes to see my options, or the high routes in that they are not much different except in the colour. By selecting the arrow on the route it will give you the route information. Adding fixes is then very easy in selecting and adding them to the sidebar, The route is noted and also is the route direction. My BNE departure is via MELOW and MANLI - SID (Standard Instrument Departure). There are no SID or STARs, but if you have the information handy then it is not to much of a problem. Distance is noted to the next waypoint, and it is very easy to add in your altitude (VNAV) as you go, or go back and fill them all in as one set later. I find adding altitudes laborious, mostly with the "Goodway" interface, here it is very easy. Adding waypoints and finding air-routes is easy as you cross the country. 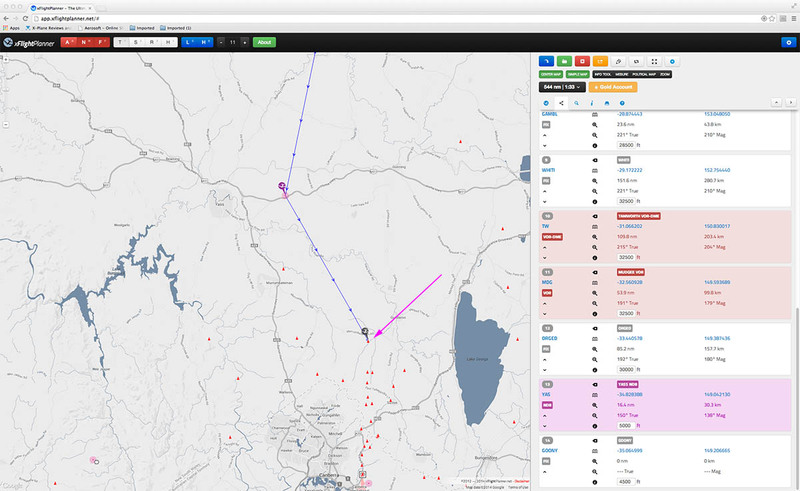 You can easily do a rough and dirty flightplan very quickly. In minutes in fact. 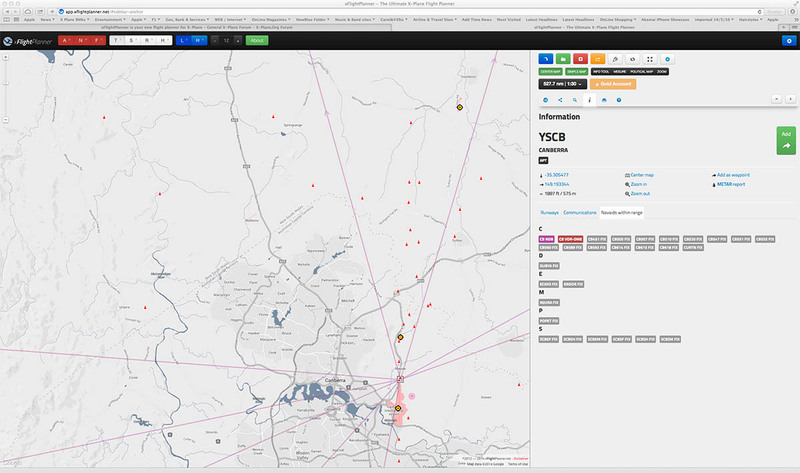 YSCB Northern approach is via YASS TWO STAR (Standard Terminal Arrival Route). It is a very simply arrival via only GOONY. Information available about your destination is quite comprehensive. With Airport runway information (width, Length, Surface), COMM frequency's and available Nav-Aids in the current area and in range, and also METAR weather information. The rest of the arrival fixes is straight forward to insert to land on RWY17. All that is left now is to download the FMS (flightplan) to your computer. To a point there is nothing really unconventional with creating this flightplan, except for possibly the speed. Some Flightplanners don't allow you to save your flightplan and that can be annoying in the fact you have to do it all again. If you have the Silver and Gold account you can save your flightplan to a database. Clicking on the hard drive icon will reveal all the flightplans available in the database. 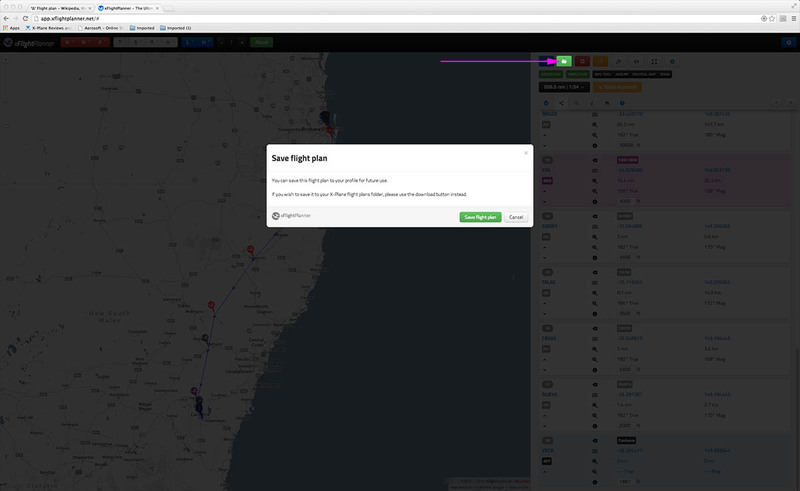 Click on the tickbox of "Show only my flightplans" will reveal only your routes. You can then download the route back into the application. 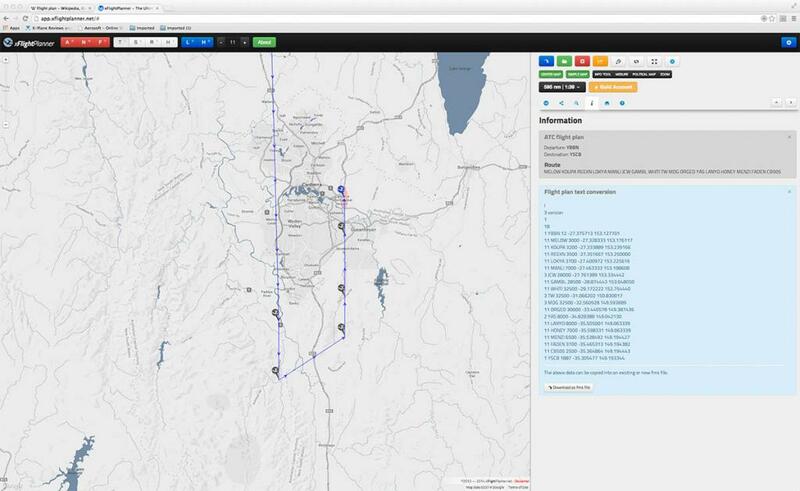 Also you can can download the route to your computer or see the route information. 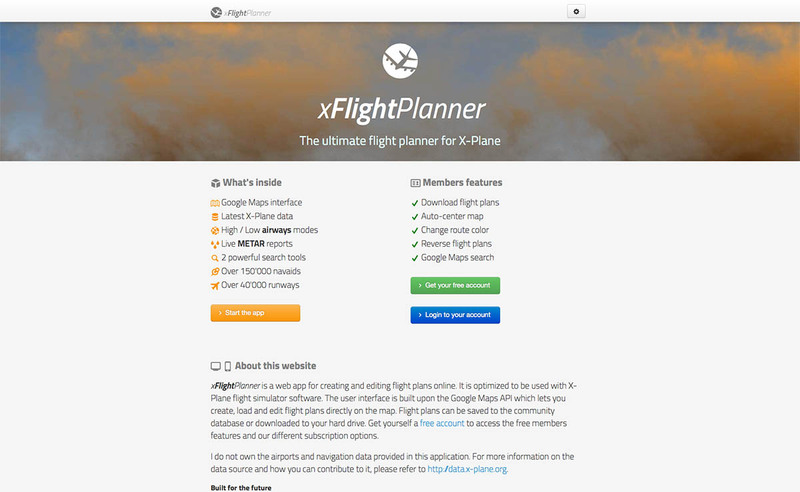 But this is not the biggest advantage and feature that xFlightplanner has over mostly other planning applications. The biggest problem was that if you wanted to change your flightplan. It became a situation of either starting from scratch or just using the flightplan you have and flying the changed route manually, The "Goodway" was a real pain if you want to swap runways or landing direction. It was usually a restart from the beginning and the loss of your long beautiful and composed route and a lot of complaining. Worse was then you realised that you original route was going to send you headlong into a mountain. To fix that you had to go back to the waypoint before the change and start stacking them up again... more pain for just the change of one or two waypoint's on the approach path.. So we have a north approach to YSCB, but what if the wind changes and you need to land from the south? The STAR for the change of runway for the southern approach to runway 35 is called YASS TWO ALPHA, BRAVO and that takes you down to LANYO. You have another issue to deal with here also in the fact that Canberra is set in the middle of a ring of of mountains and hills? Being a Google map you have the option of seeing the terrain, of which again was a major (and dangerous) issue with the "Goodway" with no view of the actual land mass. 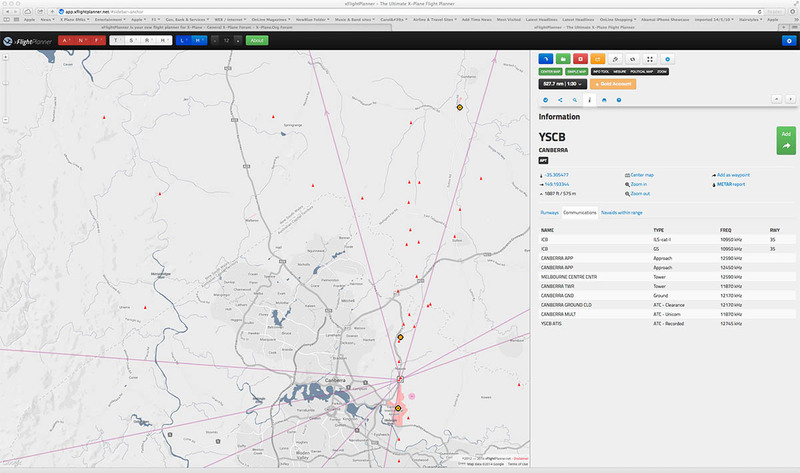 You can click on the LANYO waypoint and it will appear in the side bar but under YSCB which means the route is now distorted south. The difference with the xFlightplanner app is that you can move the waypoint up to the correct position you need... In this case under the YASS fix, but above the airport YSCB. Better still you can then remove the odd waypoints not required any more by the top tags. Now it is quite easy to add in and move into place the required fixes between LANYO and YSCB of HONEY - MENZI - FADEN - CB505 to create the correct route to RWY35 (DALEY is noted on YASS TWO A. 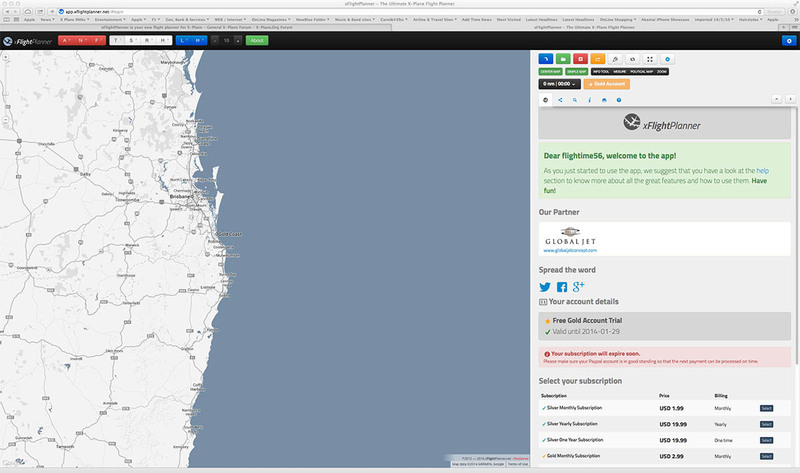 B but it is not in the Flightplanner). So it is quite easy to change any flightplan at any time you want to, or add in or takeaway and new or old fixes or even a different runway approach to get the plan exactly the way you want it. Then you can collect the information you want if you are either downloading to the computer a FMS or using the data to programme your FMC. You can now also re-save your new plan in the database in case you require a southern approach in the future. You can also change the route colour from Blue to yellow to red or black. Want a new route then just delete or reset the route. There is a help section that shows you keyboard shortcuts and tips. You can also insert a flightplan you have not created. 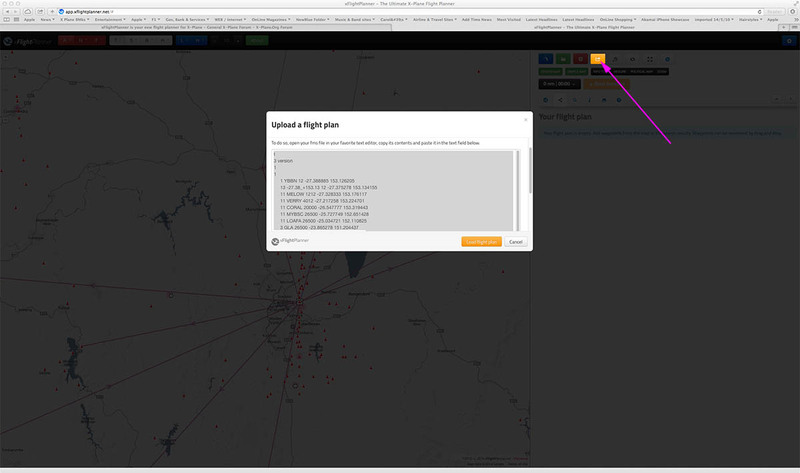 Just select "Load a flightplan" button (orange) and cut and paste in a text-editor version of your flightplan. Which is extremely handy if you want to make small changes yourself. 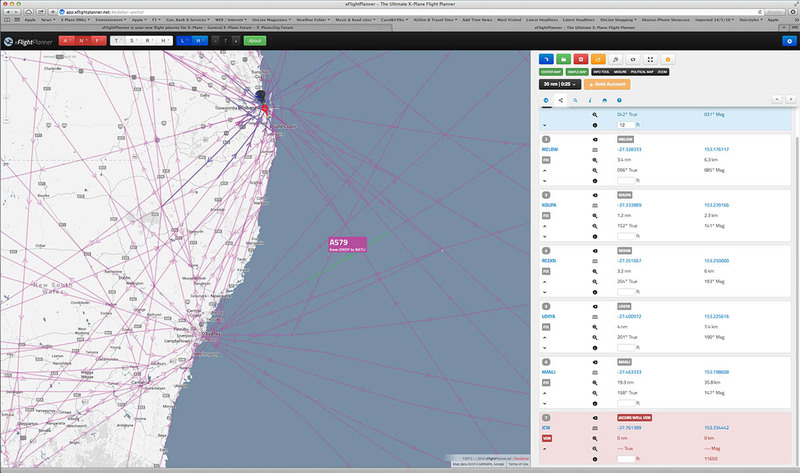 Here I am loading in my YBBN (Brisbane to Roma) route, because I want to reverse it. You can do this in the application and a simple save of the reversed route that is now ready for a download to your FMS folder. 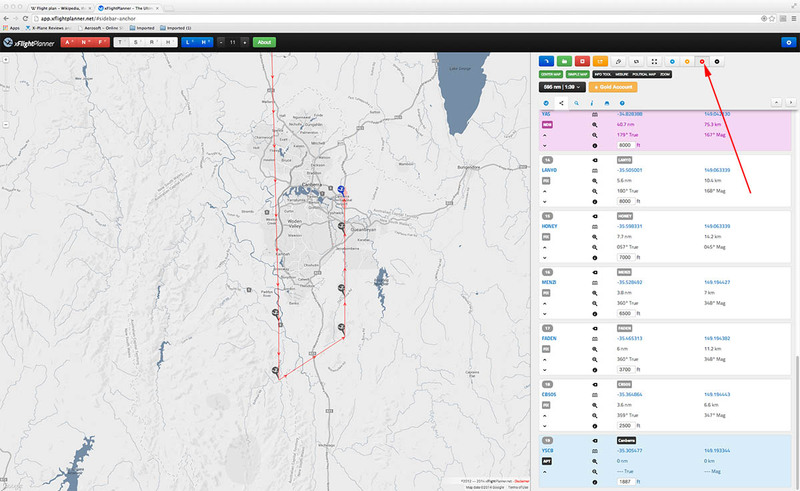 You can also adjust the size of the map to the size of the route. The route arrows reverse direction and the side-bar list is reversed. 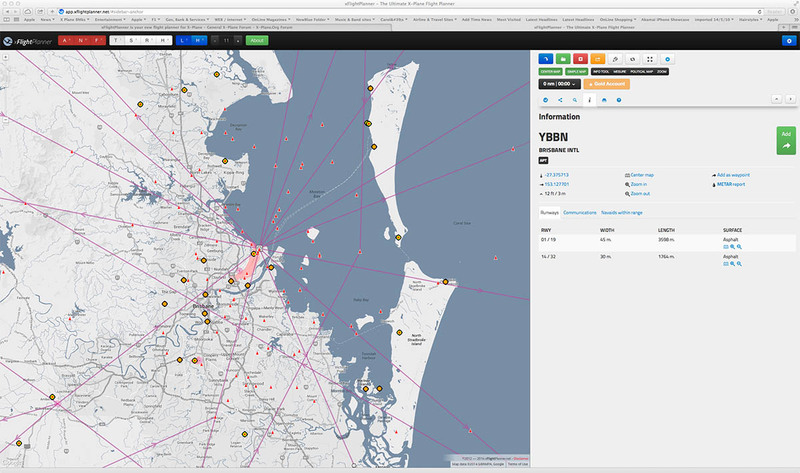 Display all navaids and airports on the map. Display basic information for airports and navaids. 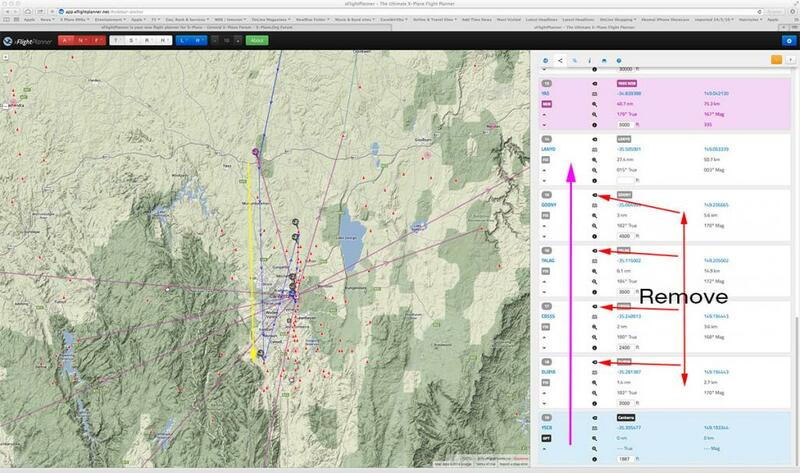 Download your flight plans as .fms files. Search anything on the map with Google. Reverse waypoints order in your flight plans. Choose between different colors for your flight plans. 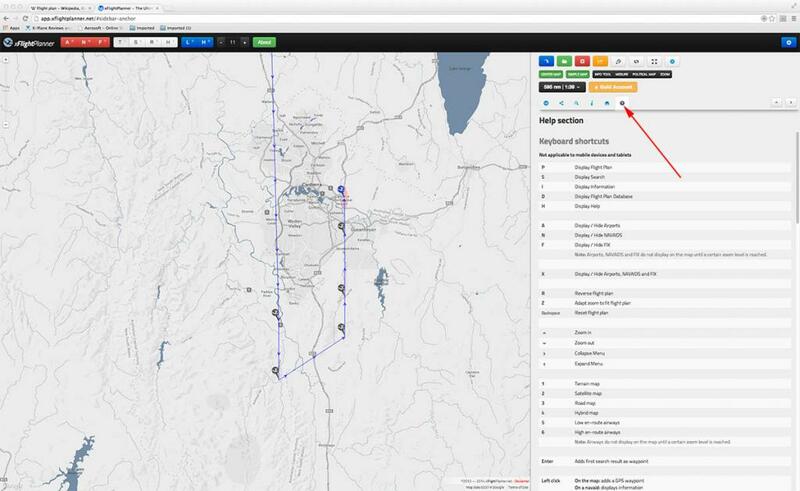 Change auto-center map settings when adding waypoints. 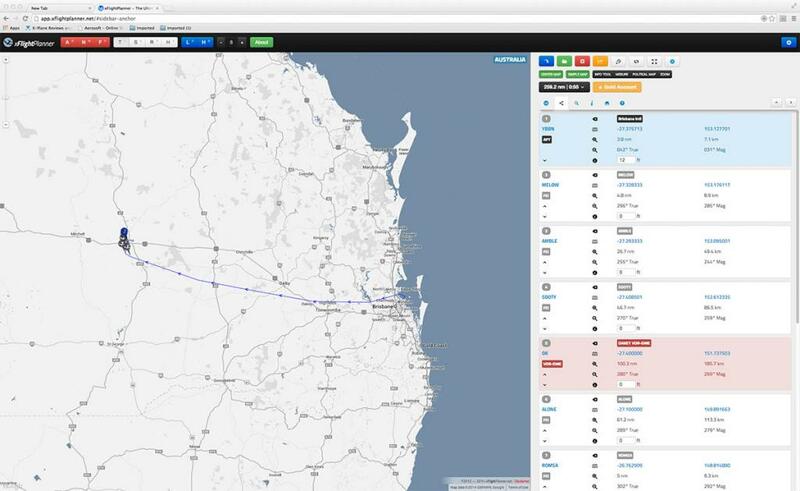 Search the local X-Plane airports and NAVAIDS database. Save an unlimited number of flight plans to your account. Access the flight plans database. Download, edit and use community flight plans. Runways information, including length, width and surface. Get exact distance and flight time for a given average speed. With taxi time calculation. 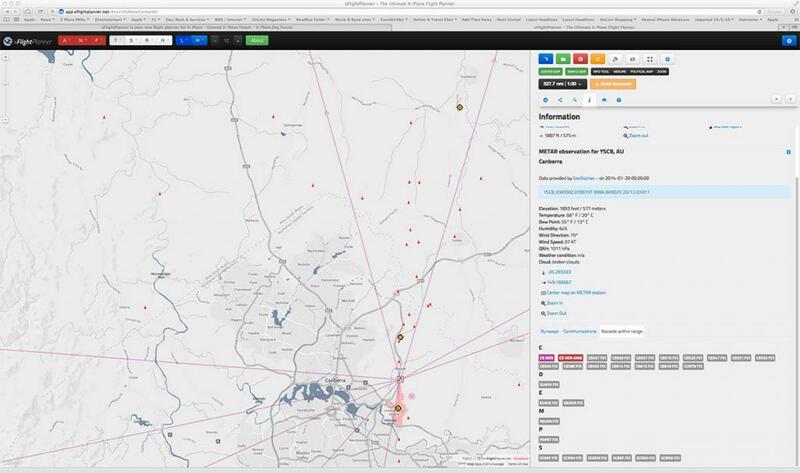 Click to get a quick overview of your entire flight plan. 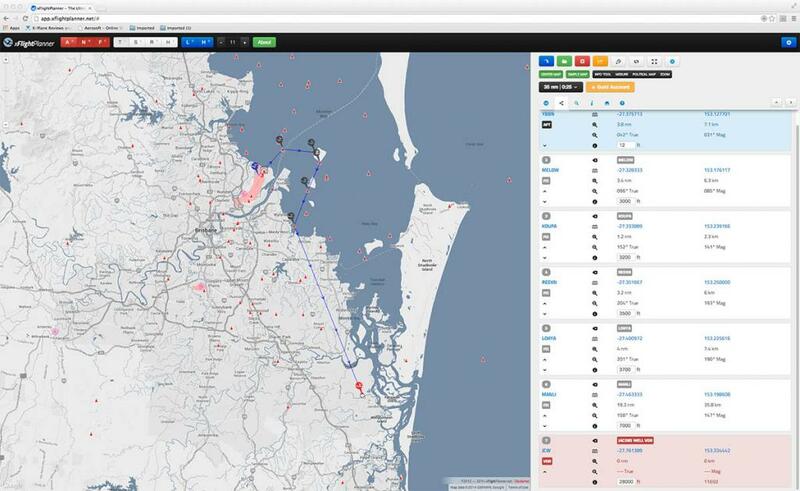 Click on the map to easily access all NAVAIDS and airfields in range. 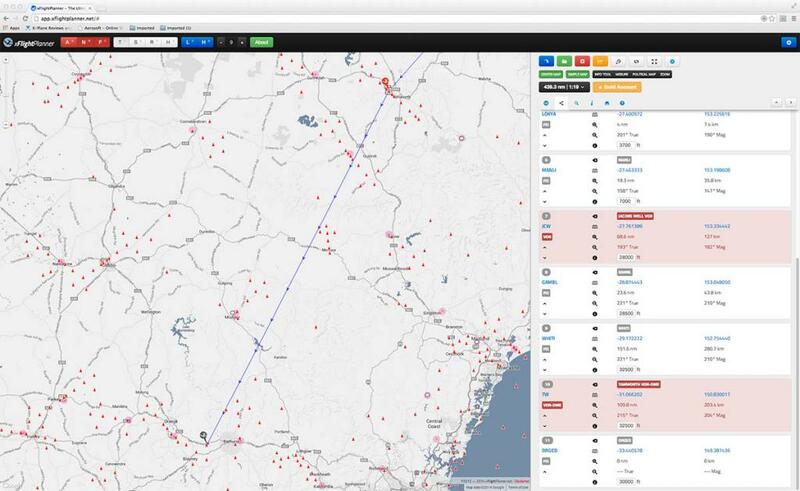 Get live METAR reports from over 9000 airports. 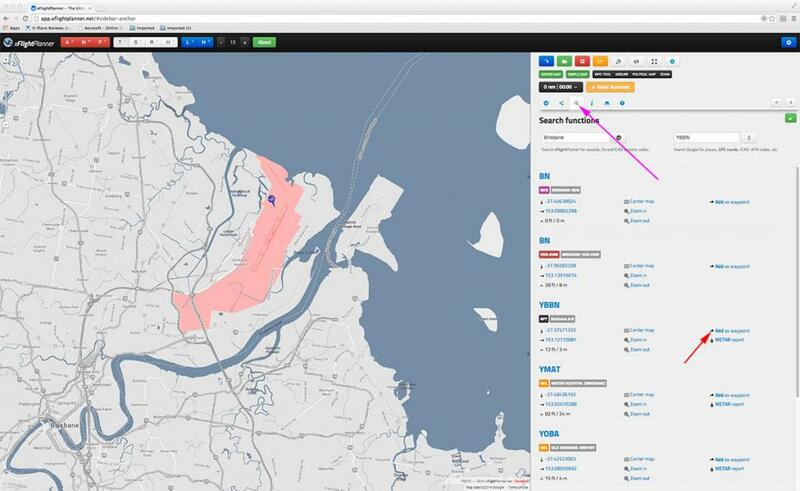 Load your existing fms flight plans on the map. Edit and save them. Display low and high en-route airways on the map. Easily list navaids within range around airfields. 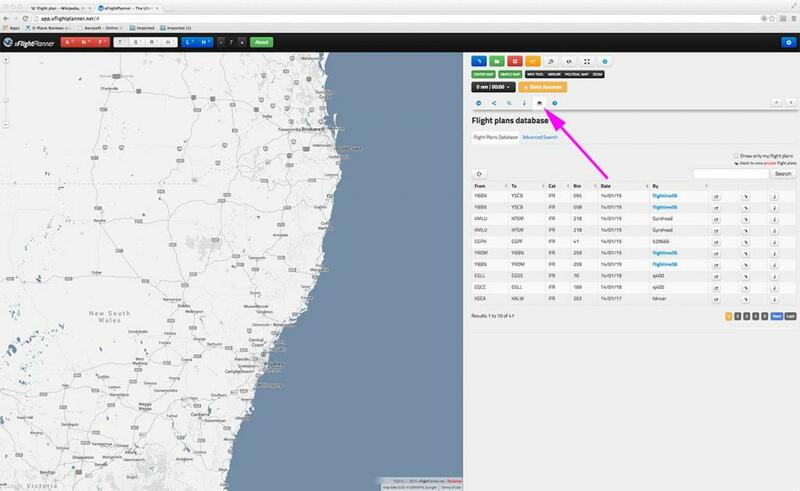 See your flight plan as text to easily copy its content in an existing or new fms file. xFlightplanner slightly buggy in places, but not overwhelming in a way to want you to go somewhere else find another flightplanner and there is no doubt these few niggles will be quickly worked out. It is very easy and quick to do flightplans. But the biggest asset here is certainly the flexibility to change those plans after creating a route. In reloading them and adjusting them to a new flightplan is going to keep you happy for hours. The interface is very good and nice and clean, except for the over large side-bar which must be worse on a laptop or iPad (of which it is, as I checked) than my "27" iMac. The biggest consideration is cost. I was faced in paying $US29.00 for the 'Goodwayv4" and finally dropped the cash because I needed the application which was very good at the time in XP9. It was a worthwhile investment. And it has been invaluable to me as a user. But to spend nearly $30 bucks on a... flightplanner? So your choice is really to either do it quick and dirty and use the "Free" version or go all out for the "Gold". Most if not all will however go for the former and not the latter, and that is shame as the application is very good and very flexible. There is also another flight-planner out there. Not specific for X-Plane, however it can be used for it: PFPX. If I have to pay money could this also a good alternative? There is also another flight-planner out there. Not specific for X-Plane, however it can be used for it:†. If I have to pay money could this also a good alternative? Windows only... So its useless for a Mac user. Very expensive as well.